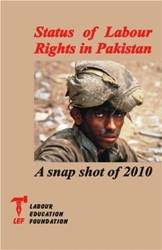 Home Based Workers (HBWs) in Pakistan must unite on a platform to raise their collective voice, to claim their rights, to make government institutions responsive towards their needs, to motivate government to ratify the ILO convention 177 on Home Work and to strive for implementation of Minimum Wage Act. These were the joint concerns and opinions shared by the participants in the ‘Home Based Workers Convention’ held by Labour Education Foundation (LEF) on 18th October 2012 at Bakhtiar Labour Hall Lahore. The convention was attended by approximately 400 HBW from Lahore and Sheikhupura districts including government and non-government stakeholders besides development practitioners and human rights activists and media persons. Speakers were from HomeNet Pakistan (Maria Kukab), Usama Tariq Deputy General Secretary Pakistan Workers Confederation, National Trade Union Federation General Secretary Niaz Khan, Labour Department Muhammad Ishaq and representatives of HBWs. While speaking on this occasion, Associate Director of LEF, Shahnaz Iqbal presented an overall situation of HBWs, reasons for increase in informal sector, challenges faced by the workers, constitutional guarantees and steps taken by the civil society and the government. Mohammad Ishaq from Labour Department said that the draft policy and the proposed law on home based workers interlinked and would simultaneously come into force. After the legislation, employees would be indentified and registered. Bill is under observation of Punjab Chief Minister. Maria Kokab from HomeNet Pakistan explained the salient components of the drafted policy for home based workers and how it will ensure their status as workers and other benefits. Advocacy for the social protection and legislation supporting HBW’s by civil society and efforts by the government of Pakistan over the last decade resulted in a series of consultation and a draft national policy on HBW’s was finalized. Senior social activist Nazli Javaid said the HBWs, particularly women, needed to unite in some form so that their voice could be heard. She further said that it is important to get recognition and for that HBWs have to be active and claim their rights. To ensure that the rights of the HBWs are protected and to make a significant contribution to the social development of the community, it is necessary that the HBWs are united in form of trade unions, a trade union activist Niaz Khan said while describing the importance of organizing. A documentary based on Bangle workers of Hyderabad was shown to the participants. 2: A training workshop on the topic of problems and process of unionization was organized with home based workers by the Labour Education Foundation. Around 40 women belonging to Toba Tek Singh, Kamaliya and Gojra districts participated in it. Tariq Mehmood, while speaking to the participants said that there are approximately 80 percent home based women workers in Toba Tek Singh. He quoted the real picture of home based workers and talked about the problems which they face in their daily lives. He further said that in kamaliya and Toba Tek Singh home based workers are getting very low wages and they face socio-economic problems. 1: Home based workers should be considered as worker. 2: Home based workers should be allowed to make Trade union. 3: Freedom of association and collective bargaining should be granted. 4: Same facilities should be given to home based workers which general workers are getting under Labour Laws. Interview of Shiekh Kalb Ali: A prominent Left wing leader, a labour lawyer by profession, started his career in Railway workers union and then was nominated as a Joint Secretary under the leadership of Mirza Ibrahim. He belongs to a middle class family, a true comrade who believes in a socialist ideology and has great command on Socio-political issues of Pakistan. Q1: What do you think about the present condition of the politics of the Left? I am a little depressed and disappointed due to fragmentation of the Left. At the same time, I am encouraged to see that Left's ideas are spreading in different social tiers of our society. People are organizing themselves at local levels for the defense of their rights and demands. I hope with the passage of time a countrywide Left political party or alliance will definitely emerge and will take forward the Left's ideology in Pakistan. The Left has played a critical role in the struggle for democracy and rights of workers in Pakistan. But since the early 1990s the Left has suffered a decline which helped in the emergence of extremist groups. Q: What is a trade union and what are relevant laws in Pakistan for trade union activities? Labour laws in Pakistan define trade union as a combination of workmen whose primary purpose is to promote and defend workers’ rights and interests in an industry or establishment. The right to join association is guaranteed under article 17 of the Constitution of Islamic Republic of Pakistan, which says, “Every citizen shall have the right to form associations or unions, subject to any reasonable restrictions imposed by law in the interest of sovereignty or integrity of Pakistan, public order or morality”. Article 17 of the Constitution not only guarantees freedom of association but also collective bargaining as a fundamental right. Keeping in view this provision, labour laws in Pakistan allow formation and joining of trade unions/associations to both the employers and the employees. There is a special law in Pakistan for trade union registration and settlement of industrial disputes i.e., Industrial Relations Act. After passage of 18th Constitutional amendment, labour is no longer a subject on concurrent list i.e. central government can no longer legislate in labour related matters. Though provinces are allowed to legislate in labour matters now, yet only Punjab province has enacted its “Punjab Industrial Relations Act 2010”. Workers are entitled to join a union without previous authorization with any union ; however, they can become members of only one union at a time. If a worker joins more than one union at a time, his earlier membership will get cancelled. Moreover, both workers and employers have the right to join federations and confederations, which have the right to affiliate with international organizations. Q2: What is a living wage? A living wage is an income for work that is sufficient to satisfy the basic needs of an employee and his/her family. This means that the worker gets enough money to pay for sufficient food, housing, clothing and other indispensable services such as transportation, healthcare, and children’s education. The part of the income to pay for these ‘other’ indispensable needs is also known as ‘discretionary’ income because it is at everyone’s own discretion how this part of the wage will be used. Thus for families with children education will have priority. But for childless workers expenses for healthcare, leisure, or transport may be more important. Hence the term ‘discretion’: everyone should have the choice to spend part of their income in whatever way they like, i.e. at their own discretion. Q: What are international labour standards? International Labour Standards, in the form of conventions and recommendations, have been set up by the ILO and its tripartite constituents to safeguard the fundamental rights of workers. Currently, there are 188 conventions and 200 recommendations. The difference between Conventions and Recommendations is that Conventions are legally binding treaties after ratification however recommendations are just policy guidelines. A country can't be forced to follow the recommendations however it is under legal obligation to respect and follow the ratified conventions. A member country is also under obligation to respect ILO Core Conventions which cover the fundamental rights at work i.e. 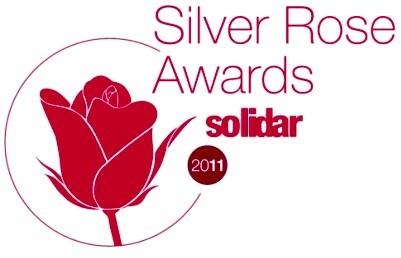 child labour, forced/bonded labour, equality and freedom to organize and represent. Pakistan does not follow the direct enforcement of international treaties principle, which means that when ratified, it also has to change the labour law and these international conventions can be applied only though national labour law. Q3: Is Living wage a basic human right? To earn a living wage, the employee should not be required to work excessively long hours. A living wage should be earned during normal working hours. What is considered ‘normal working hours’ however varies across countries? Yet, international organizations such as the ILO who foster decent work standards, advise that a normal working week should not exceed 48 hours. But living wage can also vary over time. It can rise not only with inflation (continuous rise in prices over time) but also with economic progress of a country. The World Bank, the OECD, the ILO and the United Nations acknowledge living wage to be a fundamental human right. Each individual who works for a living should have a right to an income that secures him/her and his/her family a decent living standard, in terms of food, housing, clothing, health, education and means to get around. Q: What will you say to the working class of Pakistan? In present era the situation of Pakistan is not good. Politicians are not giving much attention to the problems faced by the general public. I personally believe that working class should unite and work with trade unions. Most importantly they should come in power politics with the help of these trade unions and labour organizations. 4: Labour Community organizations held 7 study circles in different areas of Sheikupura and Lahore in October 2012 on the topic of “Present Situation of Home Based Workers”. Approximately 119 women attended these seven study circles. The main focus for these study circles was to enhance their knowledge and give proper information regarding their work. Study circles highlighted that woman home based workers in Pakistan are often exploited, receiving low wages and having no access to social security schemes. 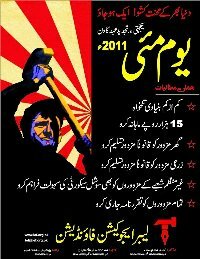 But due to five years struggle, a bill for home based workers has been presented in Punjab Assembly to get approval. 1: Home based workers should be considered as a worker. 2: Rs. 15,000 should be the minimum salary per month. 3: Social Security cards should be issued. 4: For getting Identity Card, mobile vans should be arranged.